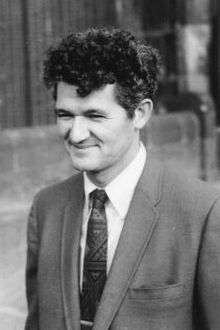 Peter David Lax (born 1 May 1926) is a Hungarian-born American mathematician working in the areas of pure and applied mathematics. He has made important contributions to integrable systems, fluid dynamics and shock waves, solitonic physics, hyperbolic conservation laws, and mathematical and scientific computing, among other fields. Lax is listed as an ISI highly cited researcher. Lax was born in Budapest, Hungary to a Jewish family. His parents Klara Kornfield and Henry Lax were both physicians, and his uncle, Albert Kornfeld (also known as Albert Korodi), was a mathematician and a friend of Leó Szilárd. Lax began displaying an interest in mathematics at age twelve, and soon his parents hired Rózsa Péter as a tutor for him. The family left Hungary on November 15, 1941, and traveled via Lisbon to the United States. As a high school student at Stuyvesant High School, Lax took no math classes, but competed on the school math team; in this time, he met with John von Neumann, Richard Courant, and Paul Erdős, who introduced him to Albert Einstein. As he was still 17 when he finished high school, he could avoid military service, and was able to study for three semesters at New York University. In a complex analysis class that he had begun in the role of a student, but ended up taking over as instructor, he met his future wife, Anneli Cahn (married to her first husband at that time). Before being able to complete his studies, Lax was drafted into the U.S. Army. After basic training, the Army sent him to Texas A&M University for more studies, then Oak Ridge National Laboratory, and soon afterwards to the Manhattan Project at Los Alamos, New Mexico. At Los Alamos, he began working as a calculator operator, but eventually moved on to higher-level mathematics. After the war ended, he remained with the Army at Los Alamos for another year, while taking courses at the University of New Mexico, then studied at Stanford University for a semester with Gábor Szegő and George Pólya. Lax returned to NYU for the 1946-1947 academic year, and by pooling credits from the four universities at which he had studied, he graduated that year. He stayed at NYU for his graduate studies, marrying Anneli in 1948 and earning a Ph.D. in 1949 under the supervision of Kurt O. Friedrichs. In a 1958 paper Lax stated a conjecture about matrix representations for third order hyperbolic polynomials which remained unproven for over four decades. Interest in the "Lax conjecture" grew as mathematicians working in several different areas recognized the importance of its implications in their field, until it was finally proven to be true in 2003. Lax holds a faculty position in the Department of Mathematics, Courant Institute of Mathematical Sciences, New York University. He is a member of the Norwegian Academy of Science and Letters and the National Academy of Sciences, USA. He won a Lester R. Ford Award in 1966 and again in 1973. He was awarded the National Medal of Science in 1986, the Wolf Prize in 1987, the Abel Prize in 2005 and the Lomonosov Gold Medal in 2013. The American Mathematical Society selected him as its Gibbs Lecturer for 2007. In 2012 he became a fellow of the American Mathematical Society. In 1970, the Transcendental Students took a CDC 6600 super computer hostage at NYU's Courant Institute which Lax had been instrumental in acquiring. Some of the students present, possibly members of the Weathermen, threatened to destroy the computer with incendiary devices, but Lax managed to disable the devices and save the machine. Functional Analysis, Wiley-Interscience, New York (2002). Linear Algebra and Its Applications, 2nd ed., Wiley-Interscience, New York (2007). Hyperbolic Partial Differential Equations, American Mathematical Society/Courant Institute of Mathematical Sciences (2006). Scattering Theory, with R. S. Phillips, Academic Press (1989). Hyperbolic Systems of Conservation Laws and the Mathematical Theory of Shock Waves, Society for Industrial Mathematics (1987). Decay of Solutions of Systems of Nonlinear Hyperbolic Conservation Laws, with J. Glimm, American Mathematical Society (1970). Recent Mathematical Methods in Nonlinear Wave Propagation, with G. Boillat, C. M. Dafermos, T.-P. Liu, and T. Ruggeri, Springer (1996). Scattering Theory for Automorphic Functions with R. S. Phillips, Princeton Univ. Press (2001). Calculus with Applications and Computing, with S. Burstein and A. Lax, Springer-Verlag, New York (1979). ↑ Thomson ISI. "Lax, Peter D., ISI Highly Cited Researchers". Retrieved 20 June 2009. 1 2 3 4 Albers, Donald J.; Alexanderson, Gerald L.; Reid, Constance, eds. (1990), "Peter D. Lax", More Mathematical People, Harcourt Brace Jovanovich, pp. 138–159 . 1 2 Dreifus, Claudia (29 March 2005). "A Conversation with Peter Lax – From Budapest to Los Alamos, a Life in Mathematics". New York Times. Retrieved 31 October 2007. ↑ Lewis, Adrian S.; Parrilo, Pablo A.; Ramana, Motakuri V. (2005). "The Lax conjecture is true". Proc. Amer. Math. Soc. 133 (9): 2495–2499. doi:10.1090/S0002-9939-05-07752-X. MR 2146191. ↑ Lax, Peter D. (1965). "Numerical solutions of partial differential equations". Amer. Math. Monthly. 72, Part II: 78–84. ↑ Lax, Peter D. (1972). "The formation and decay of shock waves". Amer. Math. Monthly. 79: 227–241. doi:10.2307/2316618. ↑ Lax, Peter D. (2008). "Mathematics and physics". Bull. Amer. Math. Soc. 45 (1): 135–152. doi:10.1090/s0273-0979-07-01182-2. MR 2358380. ↑ List of Fellows of the American Mathematical Society, retrieved 2013-01-27. ↑ Philip Colella (26 April 2004). "Peter Lax". Society for Industrial and Applied Mathematics. ↑ Barron, James (2015-12-07). "The Mathematicians Who Saved a Kidnapped N.Y.U. Computer". The New York Times. ↑ Zhu, Meijun (2006). "Review: Functional analysis, by Peter D. Lax" (PDF). Bull. Amer. Math. Soc. (N.S.). 43 (1): 123–126. doi:10.1090/s0273-0979-05-01073-6. O'Connor, John J.; Robertson, Edmund F., "Peter Lax", MacTutor History of Mathematics archive, University of St Andrews . Elements from his contributions to mathematics. Popularised presentation of Peter Lax by Helge Holden, published on the Abel Prize website. Dreifus, C. (29 March 2005). "A Conversation with Peter Lax: From Budapest to Los Alamos, a Life in Mathematics". New York Times. Raussen, Martin; Christian Skau (February 2006). "Interview with Peter D. Lax" (PDF). Notices of the American Mathematical Society. 53 (2): 223–9.